Winter-weary individuals may welcome the arrival of spring with open arms, but homeowners should be aware that spring often brings with it an increased risk for hazardous weather. Hailstorms commonly occur during the spring and summer months because the strong thunderstorms needed to produce hail are much more common during warm weather. 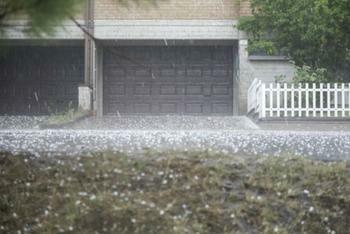 If proper precautions aren’t taken, hailstones can do serious damage to a home. In the past four years, nearly 40% of hail-related claims occurred between March and May, according to Farmers Insurance. And hail damage claims appear to be on the rise. Farmers’ data showed that claims have increased on average by 12% since 2013. Homeowners -- especially those who live in the Great Plains and the Midwest, where hailstorms are most common -- should consider taking steps to protect their property from the impact of a hailstorm. "March traditionally marks the onset of storm season in many parts of the country and that means everyone needs to be prepared," said Paul Quinn, head of claims customer experience with Farmers Insurance. "Safety and preparedness should be in the forefront of everyone's mind as they prepare for spring this year in addition to home preparation." Prepare the exterior. Reinforce your room before storm season hits. Hurricane straps or clips can be installed to help secure the roof-to-wall connections. Secure windows. Batten down the hatches by securing your windows with storm shutters. If you don’t have shutters, you can use soft protective coverings, like blankets, in or near your home's safe spaces. Bring outdoor items inside. Round up outdoor items and bring them inside to protect them. If you can’t get them all inside, remember to protect glass tables and secure lawn furniture, umbrellas, and trash receptacles. Also be sure to bring pets inside. Stay inside. Stay indoors during a hailstorm and try to stay away from skylights and doors. Close drapes, blinds, or window shades to keep the wind from blowing in any glass that may be shattered. Keep wind and water out. To prevent further storm damage, keep materials on hand to cover any broken windows or other openings to your home.